Legally Speaking: Well, that's a shocker. I too am a liberal...I fall at the 100% mark on the personal issues and at 40% on the economic issues...however, I am apparently very close to actually being considered a Libertarian. I fell smack dab in the middle of Liberal. 80% personal issues and 20% economic. Very interesting quiz.. quick and to the point. Maybe, you're wondering how come I landed on your blog. If so, you might want to apportion some of the blame to Evan Schaeffer's http://www.legalunderground.com, which by the bye has a rather neat blogroll. Anyway, upon visiting your little nook in the vast galaxy of the Internet, I surmised you'd welcome some insight concerning President William Jefferson Clinton. I, for one, can be easily persuaded that President Clinton introduced ... ah, maybe not in so many words ... "evolutionary economics". Acting within the constraints, imposed by this new economic discipline, the man made possible the hope that the nation's national debt could be discharged. darn ol'paranoid me ... before depositing a comment here on your blog, I sent an e.mail to some 63 law school professors about the article, found at the other end of the above hyperlink. 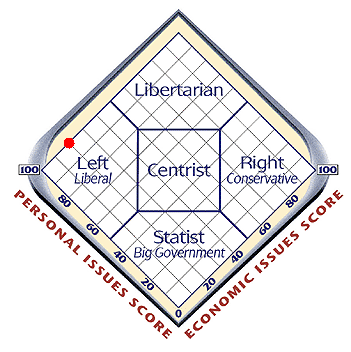 No surprise: Libertarian. I scored 90% on personal issues and 60% on econcomic issues.